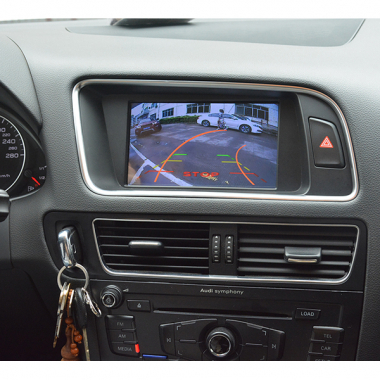 If you would like to upgrade the factory screen with a new touch screen including GPS navigation and Bluetooth and Android system for your Audi Q5 or A5 or A4, this Android head unit screen replacement meets your requirements. There are two different frames included to fit Audi Q5, A5 and A4, the frames are only compatible with left hand driving models. For right hand driving it's not suitable but you can contact us as well we have another model to fit. New 10.25" screen upgrade is also available now. As for this Audi Q5 screen upgrade/replacement, it's built-in aftermarket navigation, Bluetooth hands free phone calling function, it supports original screen menu display, not impact original function, so your original rear view camera and radio and CD player still work after installation, it can also connect an aftermarket rear view camera instead. Unlike the original navigation system update, this aftermarket Audi Q5/A5/A5 navigation can be installd Android GPS maps like Sygic, igo, and also Google maps. The built-in WiFi allows you easily download Android apps from Google playstore, you can install apps through apk installer which was already installed in this Android head unit.